Execution Room in the Campaign "Death Row". Death row prisoners are on trial for a death sentence after which they will either be put into High Risk or will be executed by the Electric Chair. The trials happen in a Parole Room in the program "Death Row Appeal". The crimes these prisoners have committed are usually numerous counts of murder and/or torture ETC. Every prisoner in death row has a Chance of Clemency percentage on their character screen. The higher this number the more likely that the prisoner won't be executed and therefore become Maximum Security. The state approved execution level is 5% by default which means that if the chance of clemency is below 5% the player will not get fined if the prisoner is found innocent after the execution. The chance of clemency is halved every time the prisoner fails the death row appeals program and is increased if he passes. It is displayed in the Todo list. The Warden, Chief and a random Spiritual Leader arrive at the prisoner's cell. The player can authorise all of the above things to happen in the order they are listed. If the chance of clemency is above 5% and the prisoner is found innocent after the execution, the player will be fined $50,000, all other Death Row inmates will be transferred to another prison by bus, and the intake queue of Death Row prisoners will be emptied immediately. Should this happen twice, the Failure Condition of Wrongful Executions will be automatically activated. If the chance of clemency is under 5% the player will be awarded $10,000, the same will happen if the prisoner was found guilty and the chance of clemency was over 5%. Executions have to be unlocked by Death Row research of the Lawyer, who also can research Reduce Execution Liability, which increases the Clemency threshold from 5% to 10%. 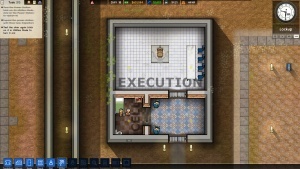 Unlike other rooms, the execution chamber is not visible at all in the Rooms menu before unlocked, to avoid stressing players who don't want to use it. Only prisoners with the risk category Death Row can be executed. This category cannot be assigned. To allow intake of prisoners of that category, your prison has to have designated Death Row zone cells. Death Row inmates do not follow any Regime and thus will not work or participate on any program except for the Death Row Appeal in the Parole Room. The Death Row campaign chapter features an execution which is performed in a much simpler manner. This is just thought as interesting objective in the tutorial. Outside of that campaign chapter, executions always have to follow the protocol described here.